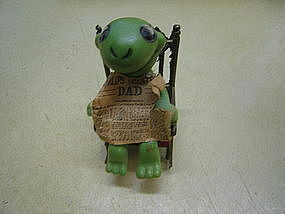 Vintage plastic frog seated in metal rocking chair. "World's Greatest Dad" is on the newspaper. The bottom is embossed with Made in Hong Kong. It measures 2 1/2 inches in height. The paper is showing age wear. I thought there was a bit of stray glue, from the newspaper, on the knee, but it came off with a warm cloth. I need your zip code to calculate the postage.